Made from fresh goats milk, Goat Soap is gentle on the skin giving you a hydrated, beautiful natural skin and relief from dry, itchy and relief from skin conditions including eczema, psoriasis and/or dermatitis. Made in Australia. The original Goat Soap is made from fresh goats milk and contains natural milk proteins, amino acids and vitamins (A, C and E). It's gentle creaminess naturally hydrates dry, itchy or sensitive skin - leaving it feeling soft, smooth and moisturised. 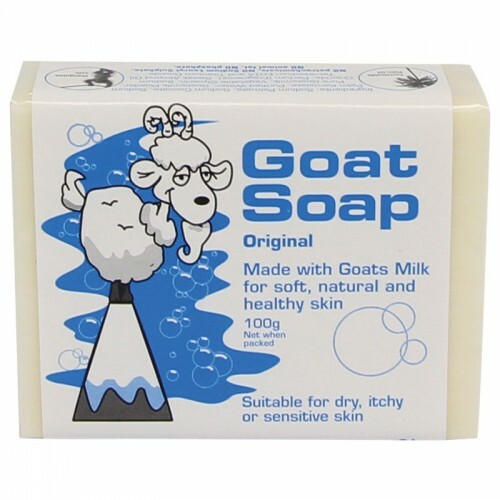 Made in Australia with all Natural ingredients, Goat Soap is pH balanced and does not contain Petrochemicals or artificial colours. Goat Soap with Coconut Oil With real coconut oil, Goat Soap with Coconut Oil providing many wel.. Goat Soap with Argan Oil Originating in Morocco, Goat Soap with Argan Oil is high in vitamin E,.. Goat Soap with Oatmeal Containing real oat bran and colloidal oatmeal to help restore your skin.. Goat Soap with Manuka Honey Goat Soap with Manuka Honey contains real Manuka honey collected fr..